In September I had a happy day in Amsterdam. One of the first people I met there was Auke Leistra who translated my book 98 Reasons For Being into Dutch. We sat and talked outside a cafe and then went to the Rembrandt Museum a few streets away. This museum is very interesting but having Auke as my guide made it more interesting still - he helped me appreciate the light, the pigments partly ground in mortars, the narrowness and height of the building and the astonishing array of strange items Rembrandt collected to paint and draw. They were arranged on shelves, presumably just how Rembrandt had left them. They looked a little like the jumbled up artefacts stored in the basement of a natural history museum. I don't think I'd have gone to the Rembrandt museum if I hadn't met Auke so I'm grateful to him for that. But I'm even more grateful to him for translating my book - and evidently he did a very good job because the book was chosen as one of three to go into the Uitgelezen selection (which means 'exquisite' or 'finished' apparently)...though I do believe the rather nice journalist, Marnix Verplancke, that interviewed me for the newspaper De Morgen might have had something to do with that also. 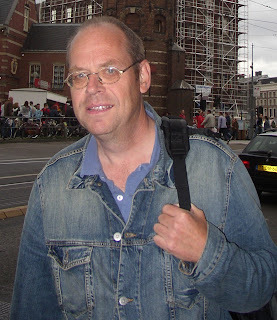 I have always been interested in the work of the translator ever since I read The way I Found Her by Rose Tremain (which features a translator) so I was delighted when Auke Leistra agreed to answer a few questions about being a translator for my blog. Auke Leistra was born in the Netherlands in 1958, and raised in the self-same lands. He is a prolific translator, and a not so prolific writer and painter. He lives with his wife and two sons in Zwolle in the self-same lands. 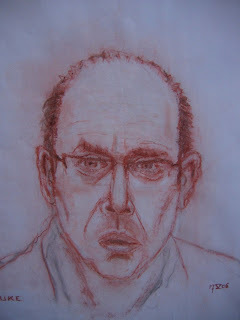 Here is Auke's self-portrait. CD: What sort of work do you translate? AL: Mostly literary novels, and some non-fiction – such as “Heroes” by Lucy Hughes-Hallett, which just appeared in my translation as “Helden” – which is Dutch for “Heroes”. Sometimes life is simple for a translator! CD: Are some works more difficult to translate than others? AL: Well... sometimes a book seems not too difficult to translate because it is such a great read. That is very tricky. The difficulty is that you will have to transform it in a great read in your target language as well. This trickiness is so preponderant that I was almost inclined to say: no, every book is as difficult to translate as the next. Some books look difficult to translate, and indeed are difficult to translate, other books look easy to translate, but they also turn out to be difficult to translate. And no, I haven’t had any books yet which seemed difficult to translate, but were in fact easy. So, they are all difficult to translate, but yes, some are more difficult to translate than others, some animals being more equal than other animals. I think this is mainly for personal reasons: some works have more appeal for you than others. The style of a book may be unruly, but another translator might find it easygoing. Of course there are factors which are not personal at all, but you can guess them: let’s say that Dubliners would be easier to translate than Finnegans Wake. CD: Do you ever feel you have had to make compromises? AL: O, certainly. Translating is many things, and compromising is one of them, the biggest compromise being the change of language. On a more detailed level: not every word or phrase is utterly translatable – sometimes you will have to add a little description where you would rather not, that sort of thing. But it is nothing to worry about: translating being compromising is not as compromising as it may sound. CD: Is it more important to be accurate or to get the right feel for a book, do you think? If you could choose. AL: Both, of course. You have no choice. But you might say that getting the right feel for a book is all about being accurate, whereas being strictly accurate sometimes prevents you from getting the feel right. CD: How long does it take you to translate a novel? CD: How do you work? AL: First I read the book, then I make a rough translation, starting from the beginning and carrying on till the last page, and then it is a matter of polishing. I always work on one book at a time. CD: Do you do any writing of your own? AL: Well, I have written a crime novel, together with a partner of mine in crime: Moord op het Pieterpad, which was published last year and ought to be translated into English. And in the past I have written short stories, a few of which were published in a literary magazine. At the moment I am doing research for a new book, but let’s get on with the next question. CD: How did you get into the business of translating? AL: Makes you wonder, doesn’t it? My parents have warned me time and again. But I studied English and...well, I don’t know. It seemed like a perfectly sensible thing to do. Besides, it is a great job. CD: Do you think the translator gets enough recognition for his or her work? AL: Hardly ever. But in other ways it is very satisfying. CD: Do you think it is necessary to have a certain sort of personality to be a translator - what would that be? AL: Let’s say that you will have to be able to master the art of subservience. You will have to be able to say what author and book want you to say, without embellishments, omissions, and other things definitely not done. Of course, it is also a creative trade. You need utter command of, and flair for, your mother tongue. CD: Do you know the work of other translators? CD: Do you think a little of the translator's personality comes through when a work is translated? CD: Can you tell who the translator is, do you think? Do they leave a 'fingerprint'? AL: Every translator would make another translation of the same book, but that does not mean to say that it’s okay if a translation is easily identifiable as the work of a certain translator. I think if it were, then maybe you would have to say that the translator is not such a good translator, and that he ought to leave his fingerprints somewhere else. AL: I hate treading on them in the dark: that grating noise keeps me from sleeping at night. CD: What is the saddest thing you’ve ever heard or seen? AL: I think of all the sad things which have crossed my sight without my noticing them, let alone paying any real attention – how much sadder can it get? AL: I don’t know. Isn’t happiness something like contentment? A great interview - I've always thought translating would be a fascinating challenge! I love this interview. I think translators are one of the least appreciated literary breed, and one of the most important. Imagine how terrible it would be if we could only read the work written in a single language. And I like Leistra's answer to the 'sad question' - so very humane and humble. prolix comes in many forms my sweet. Some have not the sophistication to sever these states. Congratulations on getting onto the list. Good luck! It must be very exciting having a book translated. Does it feel kind of weird thumbing through and not understanding a word? re earlier posts ... we too are switching to the more environmentally friendly light-bulbs and yes they take longer to brighten. For me, the one in the toilet is the most noticeable as I have usually left the room before the dim light has brightened! And yes some days one seems to have more energy than others and accordingly the day either zings or splutters. Why don't we have an "exquisite" category, I wonder? I always find what stumps a translator to be fascinating--I've been difficult on Southern flora, for one thing. I wish you had been immodest and asked him what was difficult (or especially fun) to translate in your book! To me, this interview is especially interesting because it gives a sense of the multi-faceted man, yet also conveys his high and humble role as Servant of the Book. Wow, I never realised that a well-respected literary translator was living in my adopted home town of Zwolle (native home town: Hackney, London). I am a Dutch-to-English translator and wholeheartedly acknowledge the pitfalls and compromises one has to make when translating ANY piece of text. And it is so true that getting the feel and emotional texture right is far more important than pinpoint accuracy. Maybe I can have a stab at translating your Moord op het Pieterpad, Auke??? Ywitches: Yes - translating for me would be an utterly impossible feat. I am useless at languages. Lee: I agree completely. I remember talking to a translator once who had won an award - so there is some recognition, I guess. Though I suppose it is subject to the usual vagaries of this award-giving business. Thanks CB - I think having my work translated is the best thing that has happened to me for sometime. Ambo did such a great job of the book too. I'm very grateful. Yes, those lightbulbs are slow - though I do find this varies a lot between bulbs. Interesting. I expect someonw has made a study somewhere. Kumar: Have you a website? If you want to email me my address is on the author page of my website (top of the side bar on my blog). Tammy: Thank you! A I was writing this your comment came in. We were almost speaking to each other.